About a six minute drive from Tech stands a glimpse into the future of how humanity gets its food. The Museum of Design Atlanta’s newest exhibit “Food by Design: Sustaining the Future” opened Jan. 25 and showcases ways that designers have tackled issues pertaining to how the United States gets its fresh produce. From agricultural revolutions to grocery store innovations to urban gardens, “Food by Design” focuses on sustainable methods of growing food and transporting it to the consumer. 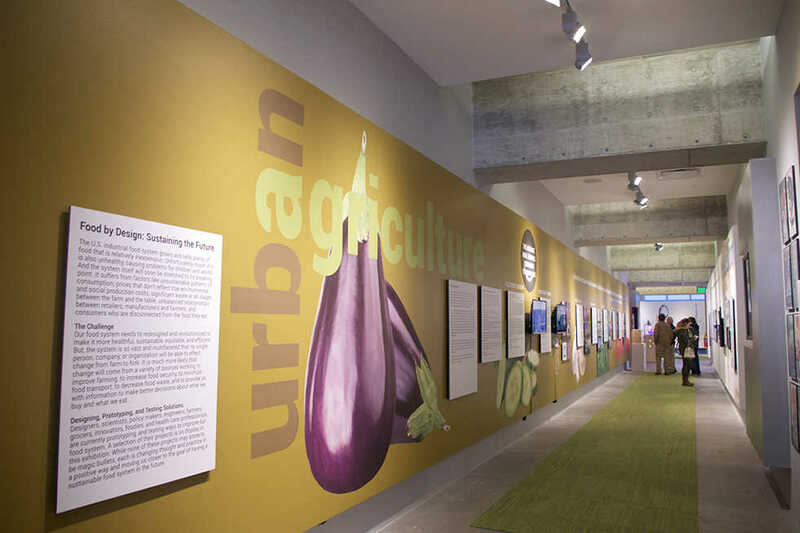 The main hallway that visitors first walk down features urban agriculture, which is how cities and areas with high population density can grow their own food for themselves and their neighbors. Atlanta recently joined cities like Boston and Chicago in passing a progressive city ordinance that allows residents to grow their own food, obtain a business license to sell that food and take out small loans to support their growing agriculture business. This 2014 ordinance aimed to revitalize communities by offering a way to turn empty, unused land into small, market gardens. Farmers market revolutions and food transport innovations await visitors in a room to the right of the main hallway. Here, the grocery store undergoes a twenty-first century makeover. Indoor vertical farms stores are being piloted in Germany, and virtual grocery stores in Chicago and Philadelphia allow shoppers to select items and schedule deliveries on their smartphones. The future of farmers markets could include new ways to transport fresh produce and small, urban field markets stationed along mass transit routes in major cities. These innovations could help solve urban issues like “food deserts,” which are areas and communities without access to a grocery store or fresh produce. Food deserts are already a problem in Atlanta neighborhoods, with dozens located in Norcross, Decatur, Douglasville, Lithonia, and Union City. Many of these areas are low-income, and residents may not have access to reliable transportation or their commute may take a significant amount of time. Tech even has its hand in determining the future of food. At the end of the main hallway a, startup from Tech alumni Alex Weiss and Rowan Subasignhe named Replantable is featured. The display features a nanofarm that allows people to grow fresh produce in their own home. Replantable only uses $1 worth of electricity per month, has no pumps or filters to clean and can be stacked with other nanofarm units to create a living, organic wall inside a tiny urban apartment. Replantable is located just before an entire room dedicated to revolutions in food itself. Innovators as small as local designers and as large as international corporations are working on new developments in what people eat, from vertical home gardens watered by a rocking chair to IBM’s cognitive cooking system. Just off the center of the room is a 3D printer that can print in chocolate and sensors that can detect when fruit on trees are ripe for the picking. Everywhere visitors look, design is revolutionizing how consumers get their food. Aside from a glimpse into how the agricultural-industrial landscape could change in the next few years, “Food by Design” is also a largely local undertaking. The exhibit was designed and executed by local graphic artists and designers. MODA has worked with everyone from illustrators to farmers to give visitors an immersive and informative walk into the future. As Atlanta is slated to become one of the US’s next megacities, it will have to adapt to an influx of population while also not having the space to produce food for everyone. MODA offers solutions to help large, urban areas tackle food deserts and sustainable production in a time when urbanization and increased population density is on the rise. As students at an institution dedicated to innovation and problem solving, “Food by Design” is a relevant and fascinating way to look at how designers, engineers and scientists come together to offer inventive and revolutionary solutions. “Food by Design” will be on exhibit until May 7. Tickets are only $5 with a student ID. The next Family Free Day is Feb. 12 and features a sprouting valentines activity.